Every day, law enforcement officers face incredible dangers in the line of duty, and their equipment has to take a lot of abuse. From heavy usage and harsh environmental conditions to serious vehicular accidents, it simply has to keep working because so much is at stake. In the case of mobile video systems, some of the most important evidence is recorded in situations where the devices take the worst battering. In pursuit of a fleeing motorcycle, an officer is unable to make a curve in the road and his squad car impacts against a large tree. 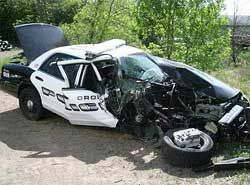 The front half of the vehicle is almost completely destroyed, however, the officer thankfully survives with only bumps and bruises due to body armor, seat belts and the air bag. 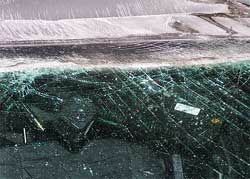 Amazingly, the in-car video system survives, as well, with only surface scratches, despite having been integrated into the rear-view mirror of the vehicle and being struck forcefully by the windshield during the collision. The system is completely functional, and the video showing exactly what happened is fully intact. The company also offers the DVF-500 Digital Video Flashlight encased in water resistant, machined aluminum armor and the lightweight FirstVu professional, wearable video system plus digital camera, which has a protective water resistant, rubberized body. Although their in-car systems handle extreme temperatures, they also offer the DV-500 Ultra, a vehicular video system that is intended to be used in direct contact with wet or otherwise harsh environmental conditions for motorcycles, boats, ATVs, etc.